2. Can sew on fabrics as adhesive may not hold on fabric fibers. 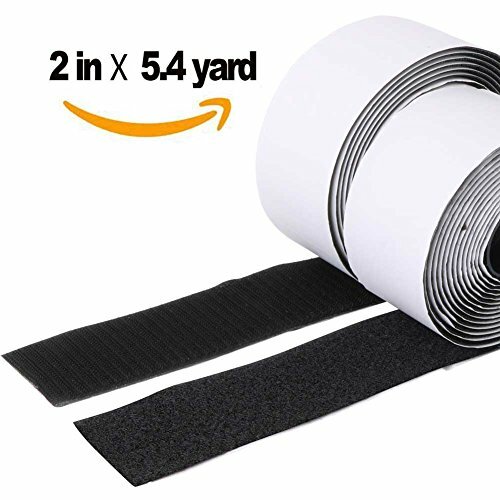 2" Hook and loop tape with adhesive, 5-yard self-adhesive tape (both sides as a complete set). We offer the best customer service & LIFETIME Warranty. Feel free to contact us whenever you have questions or problems with our products. 2 inch wide hook and loop, 5.4 yard/Roll, good for Fastening items. Adhesive hook and loop - Black tapes Sticks on smooth surfaces, such as wood, plastics, glasses, etc. Industrial Strength For Heavy duty and industrial applications use more surface area for maximum adhesion. Mounting tape which is great as a office supply, picture hanging, crafts, kitchen organizing, computer adhesive fan mount, and more. Allow several hours for adhesive to cure. This mounting tape is good for home, office, tents, school, crafts. It is also great as a office supply, kitchen organizing, picture hanging. 100% GUARANTEE&RISK FREE-We guarantee to provide 100% satisfaction with our Self Adhesive Hook and loop, just let me know if you do not like our product and we will make a replacement or refund to you. View More In Tapes, Adhesives & Sealants. If you have any questions about this product by Trubatis, contact us by completing and submitting the form below. If you are looking for a specif part number, please include it with your message. TradeGear Electrical Tape ASSORTED MATTE Rainbow Colors – 10 Pk Waterproof, Flame Retardant, Strong Rubber Based Adhesive, UL Listed – Rated for Max. 600V and 80oC Use –Measures 60’ x 3/4" x 0.07"